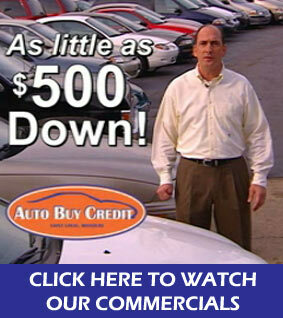 Spring is in the air and the sun is shining brightly at Auto Buy Credit! It's time to cast off those winter blues with a treat yourself to a nice set of wheels today! With multiple financing options available and warranties up to 57 Months/57,000 miles (on select vehicles, see dealer for details) the options have never been better! Bad Credit? No Credit? Yeah, we do that! Unlike many other dealers, we report to the credit bureau with the goal of helping you rebuild your credit and get you moving forward, instead of running in place! Getting approved has never been easier, and we specialize in helping people who haven't established credit, or have had credit problems in the past. Apply online, or call any of our three locations today! Whether you have good credit or you've had credit problems in the past, auto shopping should be easy! Our auto loan services are designed to be hassle free and get you the loan you need -- regardless of your past credit history.